ManLifts, Man lifts. 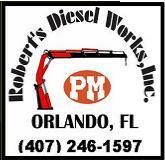 Self-Propelled Boom Lifts, Trailer-Mounted Boom Lifts, Manlift, Man Lift. For any Application. Click any image for more information. 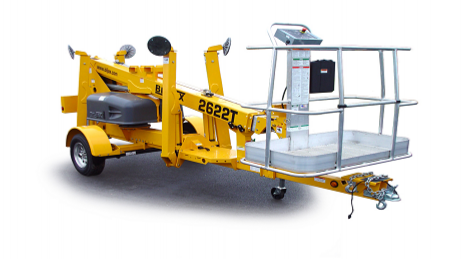 The 2622T provides 32.5' of working height and 22' of outreach and features an automatic, self-leveling hydraulic outrigger system that allows for setup in 30 seconds when all four outriggers are deployed simultaneously. The new 3632T Telescopic Aerial Work Platform. The trailer-mounted boom lift provides 42' of working height and 32' of outreach and features an automatic, self-leveling hydraulic outrigger system that allows for setup in 30 seconds when all four outriggers are deployed simultaneously. Lightweight and compact, the PT 10 features a fabricate steel superstructure and powder-coated finish. 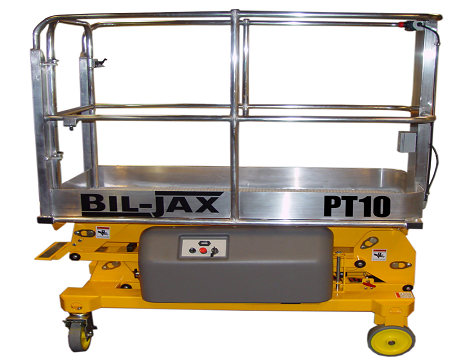 With a base width of only 30 inches, the PT 10 passes easily through standard doorways, allowing users to maneuver the machine to locations inaccessible to larger telescopic lifts. 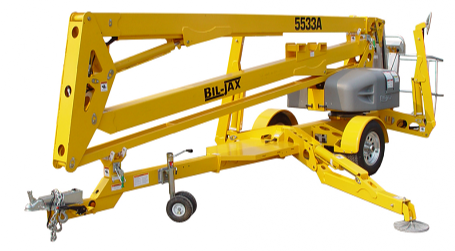 The new 3522A Articulated Aerial Work Platform. 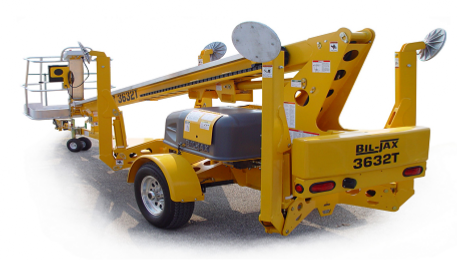 The trailer-mounted boom lift provides 43' of working height, 22' outreach, 19' up and over height, and features an automatic, self-leveling hydraulic outrigger system that allows for setup in 30 seconds when all four outriggers are deployed simultaneously. 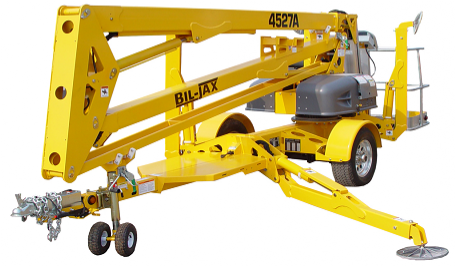 The new 4527A Articulated Aerial Work Platform. This trailer-mounted boom lift provides 51' of working height, 27' outreach, 20' 9" up and over height, and features an automatic, self-leveling hydraulic outrigger system that allows for setup in 30 seconds when all four outriggers are deployed simultaneously. This new 4527A Articulated Aerial Work Platform is available with either 24v DC battery power or a combination DC and Honda gas hybrid engine package. Manlifts, Man Lifts. Manlift. Man Lift. 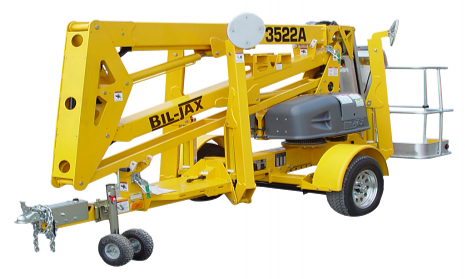 Self-Propelled Boom Lifts, Trailer-Mounted Boom Lifts, Articulating manlift. 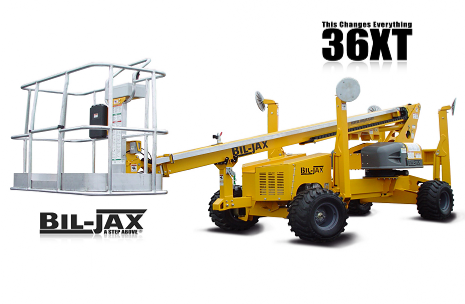 Apex Telescopic Lifts, Manlift, For any Application. 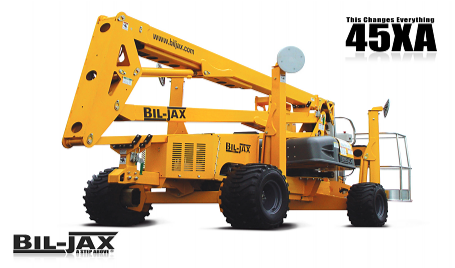 Bil-Jax manlifts.